All in One super package! Each precisely measured shape is identical in size. Students are able to directly compare the different portions. Students will be able to order them from highest to lowest, find equivalents and make direct comparisons using these hands-on resources. 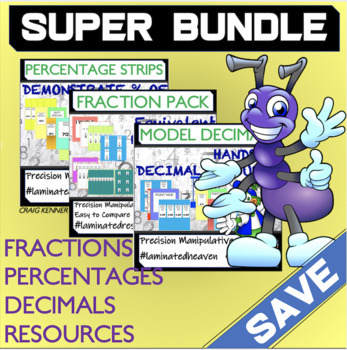 This bundle is the best way to compare, order and manipulate decimal, fractions and percentages. Download, laminate and help your students hold NEW mathematical knowledge in their hands!